Creator of Jazz Jackrabbit and the Gears of War series Cliff Bleszinski released a “cropped” screenshot of his current project Friday morning. 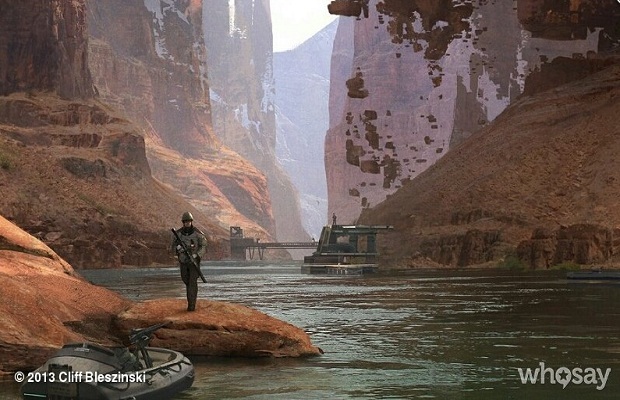 The screenshot shows a person in what looks like a military/police uniform, holding a rifle and walking through a river-threaded canyon with a what appears to be a jetski nearby. Bleszinski told VentureBeat in an interview earlier this year that going back to AAA development might happen sometime, but building a large studio of his own is “the last thing I would want to do” at the moment. What do you think this is? How long until Bleszinski makes an official announcement? Follow us on Twitter and like us on Facebook to let us know.